In Pattern Discovery: Premises Liability, renowned trial attorneys Douglas Danner and Larry Varn provide hundreds of questions and checklists for written and oral discovery, saving you time and effort during premises liability action preparation. The title includes 95 sets of pattern interrogatories and 26 sets of interrogatories you can use in conjunction with other interrogatories. Requests for production of documents, entry on, and for admission of facts which the attorney can use, with discussion on how documents, things, or land to be inspected must be set forth. Includes 54 general sets of deposition checklists, covering the most common issues involved in a premises action, and 93 specific sets of deposition checklists. 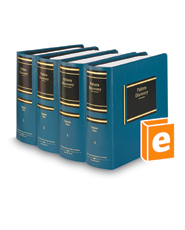 You'll also find a glossary of medico-legal terms.